Lineage. Constituted as 37 Transport Squadron on 2 Feb 1942. Activated on 14 Feb 1942. Redesignated as: 37 Troop Carrier Squadron on 4 Jul 1942; 37 Troop Carrier Squadron, Medium, on 23 Jun 1948; 37 Troop Carrier Squadron, Heavy, on 8 Oct 1949; 37 Troop Carrier Squadron, Medium, on 28 Jan 1950. Inactivated on 8 May 1952. Activated on 8 May 1952. Inactivated on 18 Jun 1957. Redesignated as 37 Troop Carrier Squadron, and activated on 17 May 1966. Organized on 1 Oct 1966. 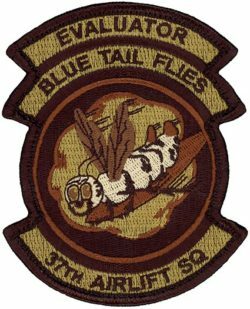 Redesignated as: 37 Tactical Airlift Squadron on 1 May 1967; 37 Airlift Squadron on 1 Apr 1992. Assignments. 316 Transport (later 316 Troop Carrier) Group, 14 Feb 1942-8 May 1952 (attached to 314 Troop Carrier Group, 21 Aug 1950-8 May 1952). 316 Troop Carrier Group, 8 May 1952-18 Jun 1957. Tactical Air Command, 17 May 1966; 316 Troop Carrier (later, 316 Tactical Airlift) Wing, 1 Oct 1966; 317 Tactical Airlift Wing, 15 Sep 1975; 435 Tactical Airlift Wing, 1 Oct 1977; 435 Tactical Airlift Group, 15 Dec 1978; 435 Tactical Airlift Wing, 1 Jun 1980; 435 Operations Group, 1 Apr 1992; 86 Operations Group, 1 Oct 1994-. Stations. Patterson Field, OH, 14 Feb 1942; Bowman Field, KY, 16 Jun 1942; Lawson Field, GA, 9 Aug 1942; Del Valle, TX, 29 Sep-12 Nov 1942; Deversoir, Egypt, 23 Nov 1942; El Adem, Libya, 10 Dec 1942; Deversoir, Egypt, 23 Dec 1942; Marble Arch, Libya, 11 Jan 1943; Ismailia, Egypt, 25 Jan 1943; Fayid, Egypt, 14 Feb 1943; El Kabrit, Egypt, 28 May 1943; El Aouina, Tunisia, 16 Oct 1943; Borizzo, Sicily, 29 Nov 1943-16 Feb 1944; Cottesmore, England, 18 Feb 1944-10 May 1945; Pope Field, NC, c. 10 Jun 1945; Greenville AAB (later, AFB), SC, 30 Jul 1946; Smyrna (later, Sewart) AFB, TN, 4 Nov 1949-4 Sep 1950; Ashiya AB, Japan, c. 11 Sep 1950; Komaki AB, Japan (operated from Ashiya AB, Japan), 29 Nov 1950; Ashiya AB, Japan, 11 Feb-8 May 1952. Sewart AFB, TN, 8 May 1952-15 Nov 1954; Ashiya AB, Japan, 15 Nov 1954-18 Jun 1957. Langley AFB, VA, 1 Oct 1966-30 Sep 1977 (deployed at RAF Mildenhall, England, 24 Nov 1968-26 Feb 1969; Rhein-Main AB, Germany, 13 Jul-26 Sep 1969; RAF Mildenhall, England, 24 Feb-11 May 1970; Rhein-Main AB, Germany, 7 Feb-13 Apr 1971; RAF Mildenhall, England, 13 Jan-14 Mar 1972; Ching Chaun Kang AB, Taiwan, 6 Dec 1972-15 Mar 1973; RAF Mildenhall, England, 31 Aug-c. 1 Oct 1973; Rhein-Main AB, Germany, 5 Apr-15 Jun 1975); Rhein-Main AB, Germany, 1 Oct 1977; Ramstein AB, Germany, 1 Oct 1994-. Aircraft. C-47, 1942-1947; C-109, 1944-1945; C-46, 1946-1947; C-82, 1947-1950; C-119, 1950-1952. C-119, 1952-1957. C-130, 1966-. Operations. During World War II, included airborne assaults on Normandy, Holland, and Germany; aerial transportation in Mediterranean Theater of Operations (MTO) and European Theater of Operations (ETO). In the Korean War, flew airborne assaults at Sukchon/Sunchon and Munsan-ni; aerial transportation between Japan and Korea. While deployed in Taiwan, crews of the squadron flew to Hanoi on 17 Feb 1973 in support of Operation Homecoming, the repatriation of American prisoners of war to Clark AB, Philippines, on 5 Mar 1973. Airlift operations during Operation Desert Shield/Storm in Southwest Asia, 14 Aug 1990-29 Mar 1991. Airdropped humanitarian supplies in Operation Provide Comfort for the relief of fleeing Kurdish refugees in northern Iraq, Apr-May 1991. Airlift and airdrop missions to Bosnia-Herzegovina for Operation Provide Promise, Jul 1992-Jan 1996; continued support with Operations Joint Endeavor/Guard/Forge, 1996-2000. Airlifted troops and equipment to Kosovo, Mar-Jun 1999. Airlifted troops and equipment throughout ETO, 2000-. Campaign Streamers. World War II: Egypt-Libya; Tunisia; Naples-Foggia; Rome-Arno; Normandy; Northern France; Rhineland; Central Europe. Korea: UN Offensive with Arrowhead; CCF Intervention; First UN Counteroffensive with Arrowhead; CCF Spring Offensive; UN Summer-Fall Offensive; Second Korean Winter. Southwest Asia: Defense of Saudi Arabia; Liberation and Defense of Kuwait. Kosovo: Air Campaign. Decorations. Distinguished Unit Citations: Middle East, 25 Nov 1942-25 Aug 1943; France, [6-7] Jun 1944; Korea, 28 Nov-10 Dec 1950. Air Force Outstanding Unit Award with Combat “V” Device: 15 Jan 2004-31 Oct 2005. Air Force Outstanding Unit Awards: 1 May 1967-30 Apr 1969; 1 May 1970-30 Apr 1972; 1 May 1972-30 Apr 1974; 15 Sep 1975-30 Apr 1977; 1 Jul 1978-30 Jun 1980; 1 Jul 1981-30 Jun 1983; 1 Jul 1983-30 Jun 1985; 1 Jul 1985-30 Jun 1987; 1 Jul 1987-30 Jun 1989; 1 Jul 1989-30 Jun 1991; 1 Jul 1991-31 Mar 1992; 1 Jul 1993-[30 Sep 1994]; [1 Oct 1994]-30 Jun 1995; 1 Jul 1996-30 Jun 1997; 24 Mar-10 Jun 1999; 1 Jan 2000-31 Dec 2001; 1 Jan-31 Dec 2002; 1 Nov 2005-31 Dec 2006; 1 Jan-31 Dec 2007. Republic of Korea Presidential Unit Citation, 1 Jul 1951-[8 May 1952]. Republic of Vietnam Gallantry Cross with Palm: 1 Oct 1967-28 Jan 1973. Emblem. Approved on 6 Jul 1951; newest rendition approved on 14 Jun 2007.